Welcome aboard January 2019 freshmen! Some 500 students took advantage of the higher learning opportunity offered by WOU and enrolled for part-time, open distance learning (ODL) mode of study during the January 2019 intake. Part of the new students attending orientation at the main campus in Penang. The highest number of new students came from the Regional Centre of Kuala Lumpur (KLRC) – which also includes those enrolled by its Bandar Utama and Klang Regional Support Centres - followed closely by Penang (PGRC), and subsequently Johor (JBRC), Kuching (KCRC) and Ipoh (IPRC). An orientation was organised by the five regional centres simultaneously on January 13th to welcome the new students from across the country. 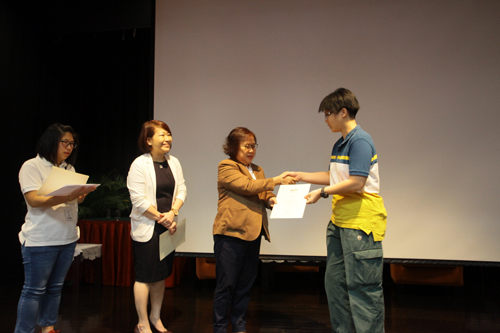 Presentation of Dean’s List award to a student from the Penang Regional Centre. The event also witnessed the presentation of the Dean’s List award, with a total of 119 students named to the list for achieving excellent academic results in the January 2018 semester. The Dean’s List honours went to 55 students from PGRC, 30 from KLRC, 15 from JBRC, 12 from KCRC and 7 from IPRC. In Ipoh, School of Science & Technology Deputy Dean (Academic) Assoc Prof Dr Lee Chee Leong was on hand to speak on the University’s ODL model and present the Dean’s List award. Dr Lee shares about the open distance learning mode of study. Accounts clerk Tiang Jia Hui of Sitiawan, who enrolled in Bachelor of Business (Hons) in Accounting, led the freshmen in the oath-taking ceremony. The Dean’s List recipient Eunice Chin Shiao Li, who is in the third year of her Bachelor of Arts (Hons) in Psychology programme, inspired everyone with her “Secrets to Balancing Work and Study at WOU” speech. Tiang leads in oath-taking at the Ipoh Regional Centre. At the main campus in Penang, 109 students turned up for the orientation, and they were welcomed by PGRC Director Ching Huey Ling and Acting Vice Chancellor Prof Zoraini Wati Abas. Prof Zoriani presented the Dean’s List award while School of Business & Administration (SBA) Acting Dean Prakash V Arumugam took to the stage to highlight WOU’s study model. Prakash elaborates on face-to-face tutorials. Soobavarman Baskaran, who enrolled in the Bachelor of Technology (Hons) in Computer Systems and Networks programme, led in the oath-taking. Soobavarman leads in reciting the students’ pledge in Penang. The academics from the main campus who represented the University at the orientation in other three regional centres were School of Education, Languages & Communications Lecturer Sean Ooi Li Hsien (KLRC), School of Humanities & Social Sciences Lecturer Irmadura Ramli (JBRC), and Student Engagement Asst Manager Fauziyah Md Aris (KCRC).